No matter how long a marriage lasts, when one spouse files for divorce, both parties are encouraged to consult with a family law attorney to protect their rights. There may be many significant issues to consider and address, such as the identification of community property, any entitlement to spousal support, and the potential award of fees and costs, to name a few. Under the state family code, “all property, real or personal, wherever situated, acquired by a married person during the marriage while domiciled in this state is community property.” As far as the division of property is concerned, California law provides that community property should be divided evenly between the spouses in divorce. In many cases, however, the parties do not agree on what constitutes separate versus marital (community) property. The outcome of this part of the case can have a tremendous financial impact on the parties going forward. An experienced family law attorney from the San Diego area can help locate, identify, and value community property in accordance with state laws. In a recent California case, In re Marriage of Jones and Ballard, the husband filed for divorce on February 14, 2014, after five years of marriage. The couple had no children. The husband had a “separate property business” and an extremely high income, whereas the wife had virtually no income. Approximately a week after the husband filed the divorce complaint, the wife filed an initial order to show cause, asking the court to award her $21,900 in monthly – temporary – spousal support pending the trial. Additionally, she sought an order directing her husband to continue making the mortgage payments on the family home where she still lived, as well as her car payments. The wife also asked the court to order her husband to advance her $30,000 for the payment of attorney fees and another $30,000 so that she could hire a forensic accountant. The wife claimed to need the forensic accountant because she is allegedly “the out-spouse,” and her husband is self-employed. There seemed to be an issue pertaining to the husband’s alleged separate property because he is the owner of a business that the wife claimed earns at least $1 million per month. The trial court awarded the wife $14,100 per month and also required the husband to make both house and car payments. The court ruled that such payments would begin on April 1. The court, however, did not award the wife any money for a forensic accountant, concluding that it was not convinced that the husband’s business was anything other than separate property. The wife appealed, arguing that the temporary support payments should have been retroactive to the divorce filing date of February 14, and she further argued that the court abused its discretion in failing to award any money for the forensic accountant. The court of appeals affirmed the lower court’s decision not to award the temporary support retroactive to the filing date, pointing out that it was only a gap of two months, and during that time, the wife remained in the family home, had a car, and had access to cash and credit cards. The court, however, reversed the decision regarding the forensic accountant, ordering the husband to pay in advance such costs in order to ensure that “the lesser income spouse has the same opportunity to present” her case as the higher income spouse. While this is an unpublished decision, and it may not be cited to or relied upon in future legal matters, the court’s underlying rationale may serve to inform later court cases within this jurisdiction. This case nicely illustrates the need to hire an experienced family law attorney, even in divorce cases when the parties have only been married a short time. 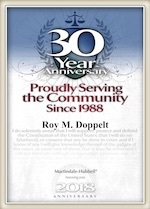 Roy M. Doppelt has been representing parties involved in divorce matters for more than 20 years. Doppelt and Forney, APLC serves clients throughout Southern California, including San Diego, Encinitas, La Jolla, and Chula Vista. For a free consultation, contact Doppelt and Forney, APLC through our website, or give us a call toll-free at (800) ROY IS IT (769-4748).